If you ask a typical homeschool parent what was the scariest thing about homeschooling high school, I bet you’d find transcripts somewhere near the top of their list. I want to remove your fear of transcripts! Cue the “Mission Impossible” theme music now! First, you need to know that grades and credits are the love languages of colleges. Colleges need to understand your child’s homeschool experience, and they need words and numbers. Your job as a homeschool parent is to take your normal and natural homeschool experience and translate it into words and numbers colleges understand. Don’t change the way you homeschool as long as it’s working. Instead, translate what you’re already doing into the language of college grades and credits, so they will understand and appreciate what you’ve done. My transcripts helped our family earn $187,000 in scholarships. Click this link if you would like help creating your own scholarship winning transcripts: Get The Total Transcript Solution! Second, recognize that all schools calculate grades and credits differently. This can help you feel more freedom, and less stress. If you believe there’s only one universal method used by all schools to define what makes an academic credit, here’s a little-known secret: even the experts don’t agree! In reality, there aren’t any hard and fast rules! Throughout my fairly exhaustive research into this topic, I found few things that all of the experts and books agreed upon when determining credit. It’s clear there’s a lot of leeway for evaluating your student’s work. Of course, this is not an invitation to be unscrupulous: your student’s grades will ultimately be either confirmed or questioned by their college entrance test results. But don’t let fear keep you from homeschooling through high school! You are competent and capable of evaluating your child, and providing them with a superior education through homeschooling! For this reason, I want to give you general, easy-to-follow guidelines. Let me explain this in the simplest terms, to take away your fear. No need for a scary-sounding boot camp involving sweat and tremendous effort while the Drill Sergeant is screaming at you. Instead, calculating homeschool credits is more like getting a massage or eating chocolate. It feels like “Ahhhhhh! That’s better!” Let me take away that worry for you. You’ll feel more confident about homeschooling once you figure out the little trick to doing it easily! You can measure credits by the book or curriculum. One textbook is one credit. One semester class is a half credit. If you don’t use pre-measured curriculum, you can measure credits by estimating hours. One credit = 120-180 hours, or about 1 hour a day. One half credit = 60-90 hours, or about half an hour per day. You can give high school credits for high school level work at any age. This means your middle schooler could earn credit in Algebra 1 or higher, high school level Biology or higher, and foreign language if you use a high school curriculum. You can give high school credit for work completed at high school age, even if your child is behind in a subject area. In public school, they would be given credit for any class they attend, even remedial classes, and you can, too. You can give high school credit for advanced work, too. Children can earn high school credit if they do college level work at any age. And they can get credit based on demonstrated expertise – i.e. if they are published or perform in an adult orchestra. I didn't think the colleges would believe my "kitchen credits," but when they saw our transcripts and records they invited my kids to a full-tuition scholarship competition. (Spoiler Alert: They both won!) 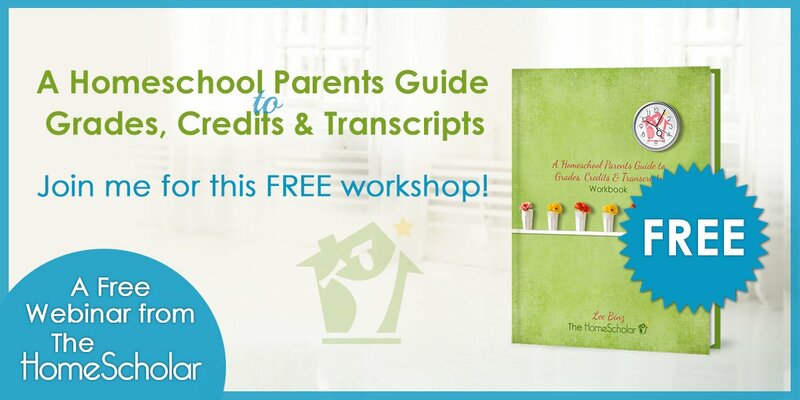 Click this link to get my book which will take you step-by-step through the process of creating professional homeschool transcripts and records the colleges will respect and believe! Get "Setting the Records Straight - How to Craft Homeschool Transcripts and Course Descriptions for College Admission and Scholarships"
Some homeschoolers think it’s tons of fun to go back through four years of high school records and try to find or recreate every possible test, quiz, and assignment. I was not one of those people! Don’t focus on tests, focus on learning. When you give grades on your transcript, think beyond tests, and consider every way you have evaluated. Your grade should include what your child has done, what they know, and what they have produced. Because not all homeschoolers use tests, I have created a quick grading estimate for homeschool parents. • Grade A or 4.0: means mastery, and the child meets high expectations, has high test scores, the child loves the subject, or the parent is not annoyed with what the child has done. • Grade B or 3.0: is good, but certainly not worth an A, or the parent is somewhat annoyed. • Grade C or 2.0: is not very good at all, the parent is both annoyed and disappointed, but kept going onto the next level in the subject. 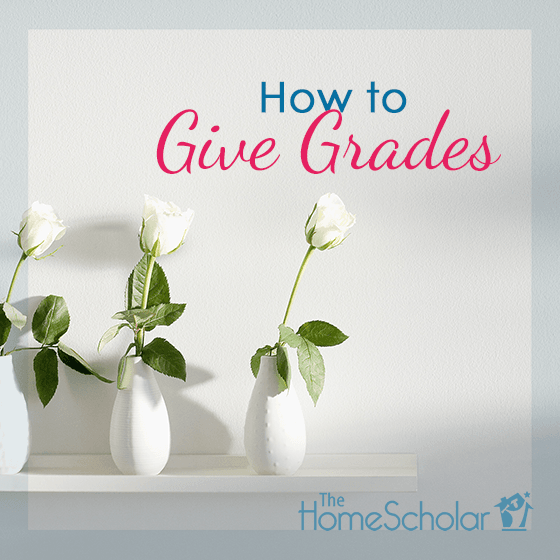 Are you stuck about how to give believable homeschool grades? This focused training will answer all your questions and get you unstuck. Making the Grades Parent Training Course! • Assign each class a credit value, for example 1 credit. • Assign each class a numerical grade, for example 4.0. • Multiply each class credit by the class numerical grade. This gives you the grade point for the class. • Add all the grade points for all completed classes. 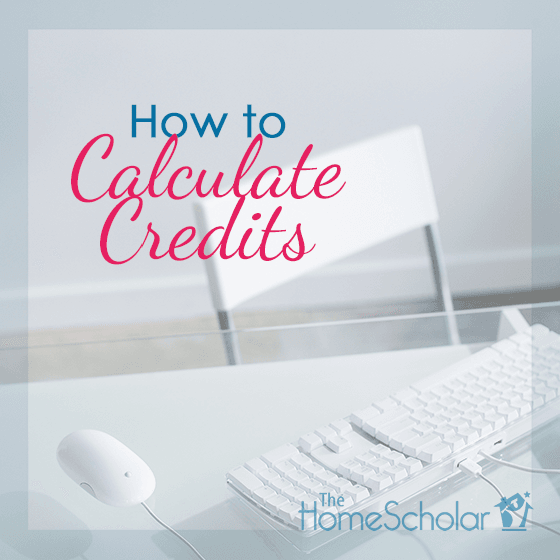 • Divide the total grade points by the number of credits completed. • The answer is the current grade point average. Is a homeschool transcript official? Yes! Can a homeschool parent name courses, award credits, and assign grades to their student? Yes! Your homeschool records are official, because your homeschool is official. You do not have to be a “professional educator” to determine what counts and what doesn’t on your child’s homeschool transcript. As the parent, you know best what your child has learned and what credits they have earned. As the homeschool parent, you are responsible to create the homeschool records your child needs for college and career. 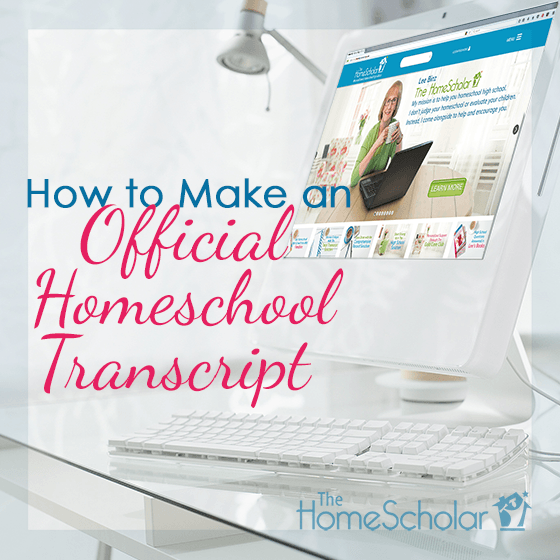 You are the one who gets to make the official homeschool transcript. Making a transcript is your job, but it’s also your joy! 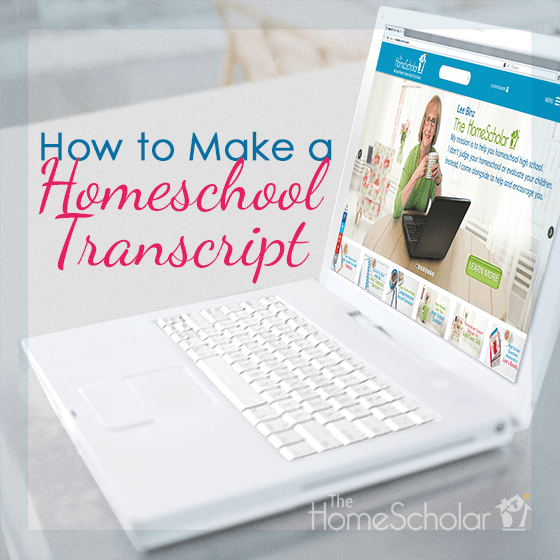 There are SO many advantages to making a homeschool transcript! You can let the personality and giftedness of your child shine through. The information you include on a homeschool transcript can help make your student very attractive to colleges and scholarship committees. If your child loves one subject, such as music or art, you can highlight their gift on the transcript. Homeschoolers can highlight the strengths and gifts of their students, demonstrated in their unique coursework and activities. Of course, you should also include the courses your child didn’t excel in, but you have the freedom to highlight your child’s individuality and make them shine. You can create courses based on your child’s unique and passionate interests, describe those courses to colleges on your child’s transcript and course descriptions, and show your child for the special and wonderful person they are. 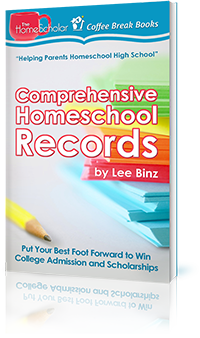 In the competitive world of college admission and scholarships, homeschool records are one of the biggest advantages a student can have. Make sure your homeschool records do your student justice! Join me for this FREE class! Learn how to create professional records that will convince colleges your student is worthy of admission and the biggest possible scholarships. You will have fun chatting with like-minded homeschool parents. We can share stories to help you relax and enjoy the ride as you homeschool through high school. Best of all, you get a free workbook you can save, that will motivate you to get the important work done of creating those homeschool records with ease. You'll love it! Come and be encouraged! REGISTER HERE! To share this infographic, grab the embed code below! The end of your homeschool transcript worries! The Total Transcript Solution includes simple DIY instructions and easy-to-use templates. Also included: A personal consultation with Lee! This is a really good value, because you can use it for all of the students in your family. You will have access to your resources forever. Does thinking about college admission for your homeschool student fill you with dread? Do you ever wonder how your humble homeschool can compete with those insanely rigorous college prep schools? You can learn to put your student in the best possible light for college admission and scholarship consideration. In this book, you will learn how college admission has changed over the last 30 years and what the colleges now look for in prospective students. Lee will give you little known insights into the mind-set of college admissions officials and how you can use these can benefit your child. She will give you three keys to successful high school preparation that won't drive you or your children crazy, and show you the core elements of a comprehensive homeschool record that will amaze and impress the colleges. You will be relieved at how achievable creating beautiful records can be, and how they can give you a real advantage in the college admissions game. Parents who consider homeschooling their children through high school are often consumed by insecurity - "Are we ruining their college chances?" Well, there's no need to worry. When it comes to college admissions and scholarships, homeschoolers have what the colleges are looking for! You CAN craft high school transcripts and records that gain choice college admission and win BIG scholarships. Copyright © 2016 The HomeScholar LLC, www.HomeHighSchoolHelp.com. Text may be reprinted without permission if used in full, except for use in a book or other publication for rent or for sale. Reprint must include this copyright, bio (below), and the original URL link (https://HomeHighSchoolHelp.com/how-to-make-a-homeschool-transcript.php). Lee Binz, The HomeScholar, specializes in helping parents homeschool high school. Get Lee's FREE Resource Guide "The 5 Biggest Mistakes Parents Make Homeschooling High School" and more freebies at www.HomeHighSchoolHelp.com.